Here is another fantastic brand for which we provide service – Kitchenaid. Here is some information about their appliances. You might be a creative genius in the kitchen, but you also like your kitchen design just-so. For your perfect formula in kitchen design, you may want to consider a KitchenAid appliance or kitchen suite. Designed for your specific needs and tastes, KitchenAid appliances guarantee that you will enjoy a new freedom of movement around your kitchen space, without sacrificing performance. KitchenAid refrigerators offer both comfort and convenience. Models are available in side-by-side, bottom mount, and French door bottom mount for the sleekest look and the most functional organization. 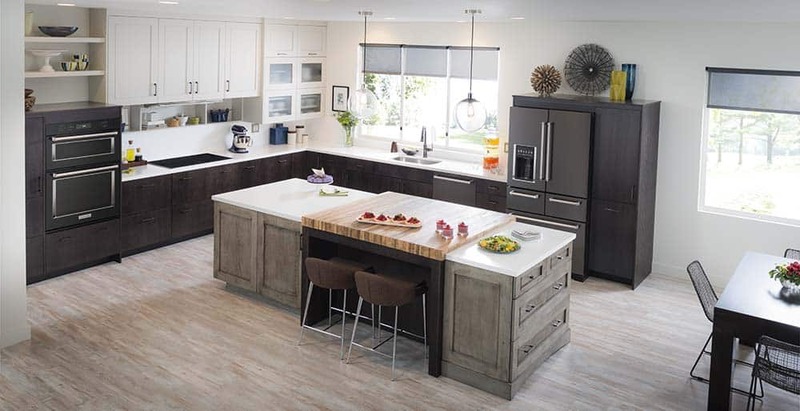 A platinum interior design with wood finish accents offers a sophisticated interior, with compartments for produce, a crisper, removable door bins, a pull-out tray, and three-tier freezer drawer, along with a top-of-the-line Preserva food care system with linear compressor. Under counter models are also available, for even more flexibility in the kitchen. Ranges are available with a chic platinum finish or black stainless steel. Your choice of range designs includes slide-in, freestanding, double oven, and commercial-style. Each model ensures even-heat true convection, which keeps a consistent, perfect temperature throughout. KitchenAid offers a variety of cooktops, including gas, electric, induction, and downdraft. You may also choose to work on a counter cooktop for increased versatility while cooking. KitchenAid’s wall ovens and microwaves are the perfect complement to your kitchen suite. Select a single, double, or combination oven with even-heat convection technology. Models include EasyConvect convection system, EvenHeat preheat and bake/broil, and FIT system with warranty. The built-in, countertop, or hood combination microwaves add to KitchenAid’s reputation for seamless design, and offer convection technology and sensor steam cycle for even temperature and a perfect product. Other product lines include dishwashers, hoods, warming drawers, disposals, compactors, and grills, all designed for increased mobility and freedom to create in your own kitchen. Check out the new product line of black stainless steel appliances for seamless integration and a contemporary look. If you are the master of your kitchen domain, make sure it is designed around your lifestyle with a KitchenAid appliance or kitchen suite. C & W Appliance Repair offers repairs and advice for all your KitchenAid appliances. Contact us today with questions or concerns about your appliances.